This has been the most difficult week so far in adding turkey dishes to my menu. I didn't eat any turkey while on holiday on Belgium, I didn't see it on the menu but they were mostly in Dutch so I could have just been missing it. It wasn't until we returned home mid week that we were back on the turkey switch. If I had seen a turkey dish I would have tried it but to be honest I wasn't really going out of my way looking for it either, I was too busy enjoying my holiday. Once we were back home we had a really nice sweet piquante pepper relish from a recipe on the British Turkey website and the accompanying turkey steaks were grilled in black pepper and parmesan. 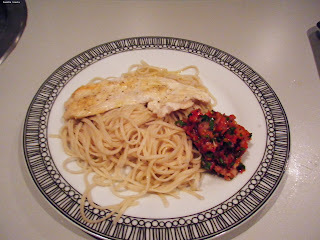 I added noodles to make the dish a bit more filling, I did previously with our pineapple salsa. Peppadew is the brand of peppers which the recipe is named after. Peppadew are these bright pickled peppers that are just amazing, they aren't really spicy, they are skinned so they are soft and really juicy and packed with flavour. I only realised after I had blitzed the relish ingredients in the blender that the recipe didn't actually state to do that, I should have left the ingredients whole. I don't think I lost any thing in doing it, I didn't blend them to a very smooth paste and the relish still had a chunky consistency. As everything was raw and straight from the fridge the relish was also really fresh cool and refreshing. With our holiday this week, I found it a bit more difficult this week to get organised enough to get my turkey meals in so I really appreciated having this speedy Peppadew relish recipe as I didn't have a lot of time to spend in the kitchen. I now have turkey in the freezer for next week and I'm planning a creamy mushroom turkey dish. Next week is also national curry week so I'm planning a turkey curry too. I'd like to try a new recipe for the curry so if you have a favourite turkey curry recipe that I could try out please do share it in the comments.